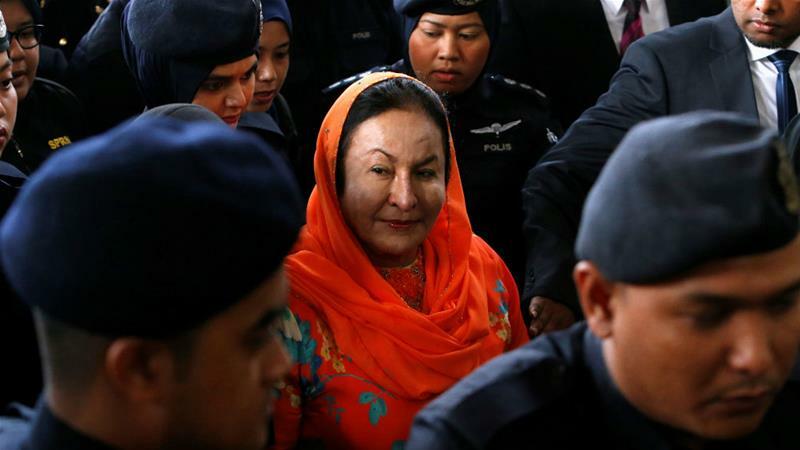 Kuala Lumpur, Malaysia – Rosmah Mansor, wife of the former Malaysian prime minister, appeared in court on Thursday to face 17 charges of money laundering and unpaid taxes as authorities step up their investigation into the multibillion-dollar 1MDB scandal. Rosmah arrived at the sprawling court complex at 8:25 am (00:25 GMT) dressed in an orange baju kurung traditional outfit with a scarf draped loosely around her head after spending the night in custody. Escorted by officers from Malaysia’s Anti-Corruption Commission and separated from the waiting media by police, Rosmah smiled but didn’t respond to questions. Standing in the dock as the clerk took 20 minutes to read charge details, Rosmah nodded occasionally and leaned on the rail in front of the dock for support. She pleaded not guilty and was granted bail of RM2m ($482,500).